The experiences and emotions of main character McKayla, a teenager navigating everything from dating to family tragedy, are universally understood -- regardless of whether the reader knows how to properly tie ghillie laces. While settings (feiseanna held in school gymnasiums, dance studios) and subjects (hornpipes, solo dresses) are typically reserved for conversation among those close to the step dancing scene, Dorrity has a way of briefly explaining it all to readers from outside the Irish dance community through the eyes of McKayla, who, herself, is completely new to Irish dance and learning all the lingo along the way. At it’s core, “Awakening” is a coming-of-age story about a teen who, like other adolescents, is finding herself -- it just so happens that her journey to self-identify is complicated by the fact that she’s an atypical girl with special, mystical abilities. It isn’t until her Aunt Avril suddenly appears in town that McKayla begins to recognize her powers -- which, she learns, run in the family -- or how to harness them. Avril, a psychic employed by the FBI, coaches her niece, helping her to channel her own special powers while investigating a series of mysterious murders in their small Wyoming community. Though she strength in her newly discovered abilities, McKayla struggles in other ways: The mean girl at school tries to make her life a living hell, the cute boy in class breaks her heart and embarrasses her, and there’s a hellish shape-shifting creature out to kill her and her loved ones. Through all the rough spots, McKayla falls back on the support of close friends, family and the mute janitor who reluctantly agrees to teach her how to Irish dance. That same dancing janitor ends up saving McKayla’s little sister’s life at one point. The relationship between McKayla and Irish dance is one that any Irish dancer will recognize and appreciate instantly. Author Dorrity, an adult Irish dancer, keenly understands the kinds of thoughts that rush through any Irish dancer’s mind when his or her favorite hornpipe plays, or when beats of a treble jig perfectly mesh with the music. 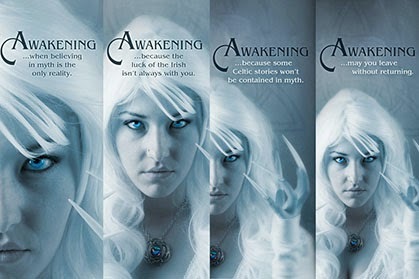 “Awakening,” inspired by Celtic mythology, is a rich read geared toward a young adult audience. The first in what will be a series, “Awakening” packages lighter themes like puppy love and popularity with heavier subject matter such as death and devastation. Every plot twist and detail holds meaning, demanding the reader’s full attention -- but it’s not a difficult task to remain attentive as Dorrity’s writing is both breezy and engaging.